A compact travel guide for San Juan visitors. Smart travel tips, recommendations for restaurants, activities, things to do and accommodation are listed. Puerto Rico boasts a rich culture and history, and San Juan is the oldest and most historic city not just on the island, but in U.S. territory. It was founded in the 16th century by Juan Ponce de Leon, who was also the first governor of the island. 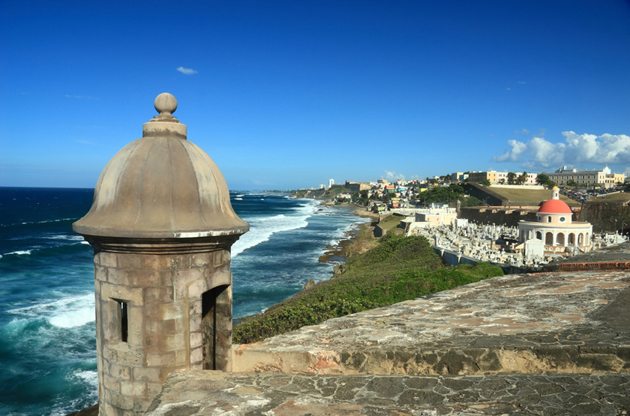 The city takes its name from Christopher Columbus’ original name for the island – “San Juan de Bautista,” which means “Saint John the Baptist.” Today San Juan is often called “the walled city” due to the walls that once encompassed the borders of what is today known as Old San Juan. The city sits on a large natural harbor on the northern coast of the island. Within the city there are three distinct sections – Old San Juan, the beach and resort areas, and the outlying communities, such as Rio Piedras, Hato Rey, and Puerta de Tierra. The blue cobblestone streets weave their way in and out of residential and commercial districts, and the beautiful architecture is characterized by Spanish colonial designs. Visitors to this part of the city will also find numerous plazas that serve as meeting places and are often adorned by statues. In contrast to Old San Juan, the beach and resort area is full of resorts, casinos, nightclubs, fancy restaurants, and upscale shops. Many travelers choose to stay in this area for its modern amenities. Travelers are constantly moving in and out of the city, at least in part due to the continual stream of cruise ships arriving and departing from its port. San Juan is located in the northern region of the main island amidst coastal plains. It is on the east of the city of Bayamón and west of Carolina. The main airport in Puerto Rico is the San Juan Luis Muñoz Marín International Airport. Outside the airport, you can find both touristic cabs and regular cabs. The former operates by city zone and charges for bags, while the latter is metered. Either way, guests will find their trip from the airport into the city to be a short 9 miles. San Juan is a lively and bustling city with plenty do to, whether visitors are simply in town for the weekend or have planned a longer stay. Guests who just want to relax should check out Condado Beach, which is just steps from the Condado Plaza Hotel and allows people to enjoy the warm sand and calm waters from sunrise to sunset. Other popular relaxation spots include Isla Verde Beach, Ocean Park Beach, and Flamenco Beach. The city is also home to a number of interesting museums. Among the most popular are the Convento de los Dominicos, Museo de Arte de Ponce, Museo de las Américas, and the Museo de Pablo Casals. The Convento de los Dominicos is a convent originally built by Dominican Friars that has at various times served as a religious building, a fortress, and the headquarters for U.S. army troops stationed on the island. The Museo de Arte de Ponce displays a vast collection of Puerto Rican and European art, including works by Van Dyck, Reubens, and Rodin. The Museo de las Américas is located in a building that used to serve as barracks for Spanish troops. Today it celebrates the culture of the Americas through painting and sculpture, archaeological finds, and other important works across multiple genres and time periods. Lastly, the Museo de Pablo Casal was converted from the famous musician’s San Juan home. Here visitors will find old photographs, memorabilia, his piano and cello, and even videotapes of his concerts. Shopping lovers will be excited to hear that San Juan is home to the largest mall in the Caribbean. The Plaza Las Américas has over 250 well-known stores, including Banana Republic and Gap. Within the mall, shoppers will also find a food court and a movie theater for those who seek a break from hunting for goods. A little further from San Juan is Las Catalinas Mall, which has more than 100 shops, including both small boutiques and large department stores. Other popular malls include Plaza Carolina, Plaza del Mercado, and San Patricio Plaza. Shoppers can also make their way through Old San Juan in search of local artisans selling handmade goods, such as pottery and jewelry. In San Juan, guests will find a plethora of dining experiences featuring both local and the international cuisine. Options include traditional Puerto Rican foods, Mexican, Asian, and European establishments, as well as small cafes. One of the best Mexican restaurants is Cielito Lindo, located in the Condado district near many of the resorts. Here, both the food and decoration seems authentic. For the best in Asian cuisine, tourists should visit Yamato, located in El San Juan Hotel and near multiple beaches, and is especially popular for its sushi. For French, diners will find 311 Trois Cent Onze to their liking, which is housed in an old cinema warehouse. Of course many travelers may wish to try some authentic Puerto Rican dishes, in which case La Mallorquina, Aguaviva or La Casita Blanca will surely delight the tastebuds. Nightlife in San Juan includes dance clubs, comedy venues, and bars. Club Brava is a classy lounge where sophisticated patrons come to listen and dance to Latin music. The Parrot Club is a swanky venue popular for both dining, dancing, and sipping delicious liquors. One option is to tour the Faro de las Cabezas de San Juan, a nature reserve that features trails, boardwalks, and observation decks overlooking El Yunque Rainforest and the other islands of the archipelago. Tourists can also take a day trip into the rainforest itself to view the many species of plants and trees, as well as wildlife. It is a good idea to take a guided tour, as the rangers are very knowledgeable about the forest. More adventurous visitors might consider signing up to take a trolley deep down into The Rio Camuy Caves, where participants can walk among the stalagmites and stalactites and view indigenous cave drawings. The capital city of Puerto Rico, San Juan is a very advantageous city in terms of hosting international gatherings like congresses, tradeshows, fairs, exhibitions, symposiums and conferences. The beautiful nature and rich culture add more joy to the trip of the delegates and the high standards of the facilities of the venues and the hotels help to make a unrivaled organizations in this city.